RALEIGH -- About 22 years ago, a strong but agile player named Rodney Rogers walked to center court of Broughton’s Holliday Gymnasium and accepted the MVP trophy for the 1989 Holiday Invitational. On Wednesday night, his oldest daughter – Roddreka Rogers – made the same triumphant walk. It’s an unprecedented father-daughter combination of MVPs that hasn’t been seen in the prep basketball tournament’s 40-year history. The senior for Myers Park averaged 17 points and 10.6 rebounds in three games in the Mix-101.5 girls bracket at the HighSchoolOT.com Holiday Invitational, leading her unbeaten Mustangs to a 50-45 victory in the championship game against Raleigh Millbrook. It was the first loss for Millbrook (12-1), last year’s 4A runners-up, in a game that could serve as a preview of the 4A state championship game. Millbrook played the three-game tournament without two starters – Katelyn Mitchell and Ryan Flowers – who were suspended for a violation of team rules. Myers Park coach Dustin Terrel said it was important to get out to an early lead, which his team did – up 28-15 at the break – by limiting Millbrook to just one second-quarter point. While Myers Park was able to force some turnovers with a full-court press, Millbrook did the same in the fourth – making for an entertaining finish. Millbrook swarmed from down 12 with 3:43 left in the game to cut the deficit to two after a 3-pointer from Mykia Jones with 53.6 seconds left. But it was too little, too late for the Wildcats, as defensive gambles in its press led to two straight Myers Park layups. 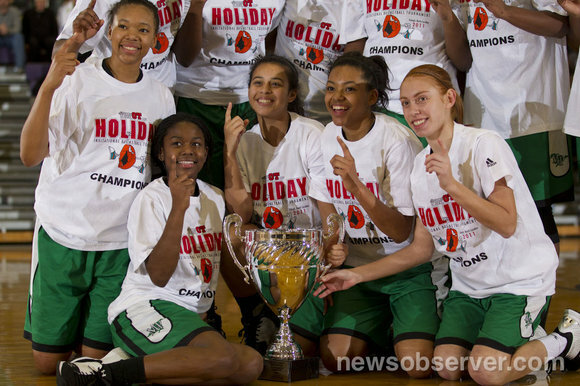 Myers Park placed three players on the all-tournament team, adding freshman Rydeiah Rogers – Roddreka’s younger sister – and sophomore Saadia Timpton. Green Hope, which finished third in the tournament after a 56-41 win against Riverside, placed Kristen Gaffney (79 points in three games) and Ashley Williams on the all-tournament team. The rest of the all-tournament team included Riverside’s Maddie McCallie, Hillside’s Morgan McGee, Panther Creek’s Kayla Seymour and Cary Christian’s Dakota Dukes.